The teaching staff of the School of Paleoanthropology of Perugia is annually selected by the Scientific Committee with the goal of building an updated, diverse and high-level educational offer. Professor of paleoanthropology and bioarchaeology at the University of Bologna, his studies focus mainly on the recent phases of human evolution (Middle-Upper Paleolithic), that is, on the spread of anatomically modern humans in Europe and the extinction of Neanderthals. His research makes extensive use of computer-based methods for morphological and morphometric analysis of skeletal remains, especially teeth. Since 2017 he has directed the project “SUCCESS – The earliest migration of Homo sapiens in southern Europe: understanding the biocultural processes that define our uniqueness”, funded by the European Research Council (ERC). The Dutch twins Adrie and Alfons Kennis are among the most popular living paleoartists. Authors of splendid illustrations of prehistoric animals, are known above all as sculptors of life size models of hominids, exhibited in some of the most important museums in the world (Natural History Museum London, Museum Naturalis Leiden, Neanderthalmuseum Mettman, MUSE Trento, etc.). Their reconstructions, extremely accurate from the scientific point of view, are distinguished by their exceptional expressiveness, which is their true trademark. 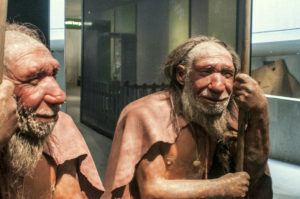 It is due to them, among other things, the recent realization of the Altamura Man’s reconstruction, exhibited in the Apulian city. Paleoanthropologist, CNRS research director at the University of Aix-Marseille, France. Her research focuses on Neanderthals and the first modern humans in the Middle East, as well as on the evolution Middle Pleistocene populations and on the variability of Homo sapiens. She is the author of numerous books, including “Mio Caro Neandertal“, written in collaboration with François Savatier and published in Italy by Bollati Boringhieri.